ATLANTA (August 26, 2016) – Georgia Aquarium will open its doors to more than 4,000 teachers on Saturday, Aug. 27 from 8 a.m. to noon in cooperation with World of Coca-Cola and the Center for Civil and Human Rights. Each educator and their guest will receive exclusive access to Georgia Aquarium’s Aquanaut Adventure: A Discovery Zone. 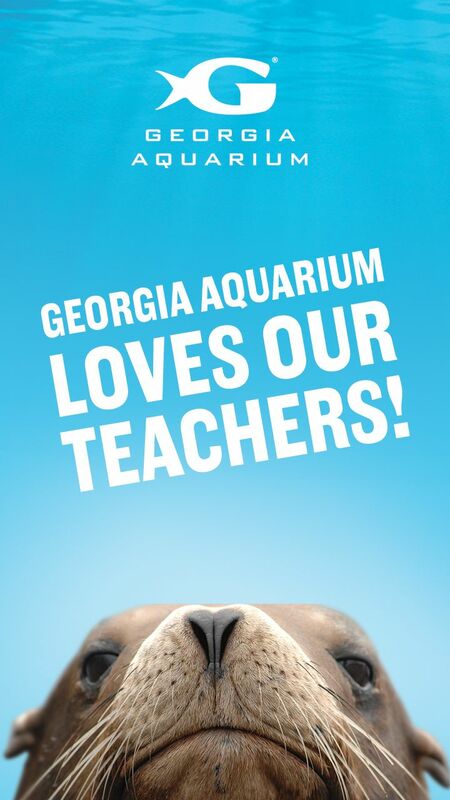 Georgia Aquarium’s education staff will be highlighting our new educational programming and introducing exciting new curricular materials. Educators will also have the chance to meet some of our unique and interesting animals. Kristyn Tumbleson will be on site discussing the new, free educational video series “STEAM Forward,” created by Georgia Aquarium and Georgia-Pacific. “STEAM Forward” and corresponding curricular materials are designed for middle school students to increase engagement and proficiency in science, technology, engineering, art, and math (STEAM) subjects. To learn more about “STEAM Forward,” please visit www.georgiaaquarium.org/STEAMForward. Educators from across the state will receive free admission to all three facilities. Check-in and educational programming will take place between 8 a.m. and noon, but guests who check in prior to noon have the opportunity to visit all facilities until they close. For more information, please visit www.georgiaaquarium.org/educator-open-house.